This article contains Amazon Affiliate links. This doesn’t change your shopping experience, but it does help out the site! Back in 2010, I quit my full time job to stay home with my son. It was an adjustment in many ways – especially financially. I had to get creative with ways to save money so that I could avoid going back to work. And while it wasn’t always easy, there are many ways that you can save money without it feeling like a sacrifice! How often do we go to the store & just grab items without really thinking about them? It is surprisingly easy to go completely without three common household products – paper towels, dryer sheets, & shaving cream. Paper Towels – When paper towels are in the house, we go through them like crazy! They are expensive, & they get wasted on every tiny spill. Years ago I did an experiment & stopped buying paper towels. Instead I bought a whole bunch of wash cloths (you can get a big pack for a great price at places like Walmart & Target), & I haven’t bought paper towels since then! I have a whole drawer filled with wash cloths, & I keep a small basket near the kitchen to throw the dirty ones into so that it’s easy to run a quick, small load of laundry as-needed. Dryer Sheets – Admittedly, I have started using dryer sheets again recently, BUT… they are definitely not a necessity. They are nice to have, but laundry turns out just fine when you don’t use them. Those few dollars in savings add up when you need to stay on a tight budget. Shaving Cream – My husband still uses shaving cream (or shaving gel), but I don’t need it. I’ve found that using shower gel or conditioner sometimes even works better than shaving cream! The other week I bought shaving cream for myself for the first time in years, but I didn’t end up liking it. Salon treatments are sooo expensive! Haircuts, hair coloring, eyebrows, & nails are tough on a tight budget. Luckily with the help of YouTube, you can get the hang of doing most things at home! Haircuts – I cut my own hair, & I cut both of my boys’ hair. I occasionally cut my husband’s hair too, but he likes his a certain way & doesn’t have the most cooperative hair 😉 I am not a hairdresser, I have no training; but I was able to figure it out! I use the method where you basically do a super high ponytail (flip your hair over upside down), cut the end of the ponytail off, & then trim as needed. It creates long layers, which works perfectly for my curly hair; & you can find a whole bunch of YouTube tutorials to help you out. Boy haircuts are also pretty simple – especially if you just do buzz cuts! Buy a pair of clippers from Amazon & buzz everything off the same length! That’s how I started, but since then I have gotten braver & tried varying lengths & styles. The key thing to remember when cutting boy hair is to NOT just cut straight across – get their hair wet, make a mohawk, & trim the top for a more natural looking style. Hair Dye – I understand that professionally colored hair often looks great, but I just cannot bring myself to spend that much money on these kinds of treatments! I buy a box of hair dye (I love the Garnier ones), & I dye my own hair. I love that if I need a change or an update, I can just do it myself in the evening after the kids go to bed! Eyebrows – Oh, boy. Eyebrows. My eyebrows can get out of control fast! I have found at-home waxing kits (the kind where there are sticky strips like this – not the wax that you have to heat up) work pretty well. Every now & then I need to go in to help get them reshaped, but then I can maintain them for a while on my own. You might have to do a little bit of research, but most communities have a lot of free resources to offer! Local Libraries – In our area, the libraries offer free museum passes that you can check out of the library (there are only a few of them so the waitlist is long, but it is still a great option!) Many libraries also offer children play areas, & they offer a lot of free activities to the community! Community Days – Keep an eye out for local businesses hosting community days, free concerts, & First Friday type events. Grocery Shopping – Our local grocery store now offers an option where you can order your groceries online! I tried it out for the first time last week & loved it. I ordered everything online from home, chose a pick up time, drove there & parked in a designated spot, called them, & they brought my groceries out to me. 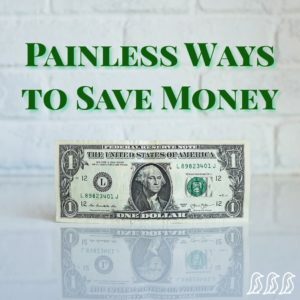 The reason that I’m including this in my saving money article is because it prevents all of those unnecessary splurges that tend to happen while you are walking through the grocery store aisles! Swap.com – Swap.com is basically an online consignment store. It has a TON of clothes to choose from, & their prices are great. It can get a little overwhelming to weed through the options, but it is worth it. My husband was thrilled to hear that I bought him new dress pants for $6.00! You can also get a 20% discount by clicking here! thredUP – thredUP has become more popular lately, but it is still one of my favorite sites for getting very nice clothing at more affordable prices. They tend to be a bit more expensive than Swap, but they also focus on higher end & higher quality apparel. Get $10 off your first order by clicking here! Frugal Websites – There are some great websites out there that focus on freebies, couponing, deals, & living a frugal life in general. Some of my favorites include the following: MoneySavingMom, Hip2Save, & Brad’s Deals. Leaving the house can get pricey in a hurry! Movies, restaurants, activities, etc… it adds up! We also tend to forget that we have so many fun things that we can do right at home. You could have a video game tournament, you could play cards or a board game together, you could grab some fancy ingredients & make a delicious meal, you could watch a movie on Netflix or even rent a newer one from Amazon instant. Hopefully this list was helpful to you! There are so many ways to save money, but this is a small sample of how you can get creative & save some real money without it feeling like you are sacrificing much of anything!